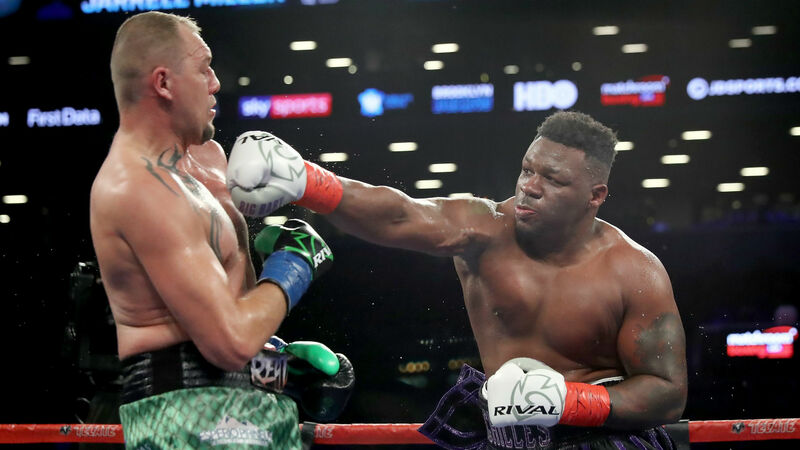 Jarrell Miller warned "punk" Anthony Joshua he has made a "huge mistake" by agreeing to fight him in Madison Square Garden as the heavyweight champion will get "run the hell over". WBO, WBA and IBF champion Joshua will put his belts on the line in what will be his first professional bout outside the United Kingdom on June 1. The unbeaten Miller and Joshua have already squared up in New York at a promotional event ahead of the Brit's fight with Alexander Povetkin last year. Miller, nicknamed 'Big Baby', says Joshua will regret heading back across the Atlantic to make his debut in the United States. "AJ is making a huge mistake coming over here to fight me in my own backyard," said the Brooklyn native. "He wants to announce himself on the American stage but all he's doing is delivering me those belts by hand. It's dog eat dog in the ring and this dog has got a bigger bite, he'll be leaving New York empty-handed. "This is the fight that I've been chasing all my life and on June 1 I'm going to achieve the thing I was born to do and win the heavyweight championship of the world. "That punk AJ is standing in the way of my dreams and on June 1 he's getting run the hell over."